Daimler`s strongest arm Brabus, is well-known for building impressive rides with astonishing good looks and impressive performance under the hood. But there is a limited-Rocket series from Brabus that takes things beyond common sense – one of those striking cars that will be officially displayed at the upcoming 2017 Frankfurt Motor Show as the most powerful and fastest cabrio, is no other than the Brabus Mercedes S65 Cabrio Rocket 900. And that for the hefty price of a half million euros. The video below provides a full insight on the car`s exquisite exterior and mega-power under the hood, but I feel it is also our duty to make a thorough presentation of the cabrio`s exquisite features. As you can depict from the video, we are dealing here with an extremely aggressive ride, thanks to the new full carbon aero kit, 21-inch alloy wheels, high-performance suspension system and brakes. Brabus has also enhanced the looks of the interior, which perfectly matches the car`s exterior aggressive attitude. But the car`s main highlight is the power under the hood. This monster on four wheels comes with a V12 turbo engine, capable of churning out a fantastic 900 horsepower and whopping 1,500 Nm of torque. Add the 350 km/h top speed and you can push the pedal to the metal to reach 100 km/h in a staggering 3.9 seconds, which for a cabrio, is exceptional. 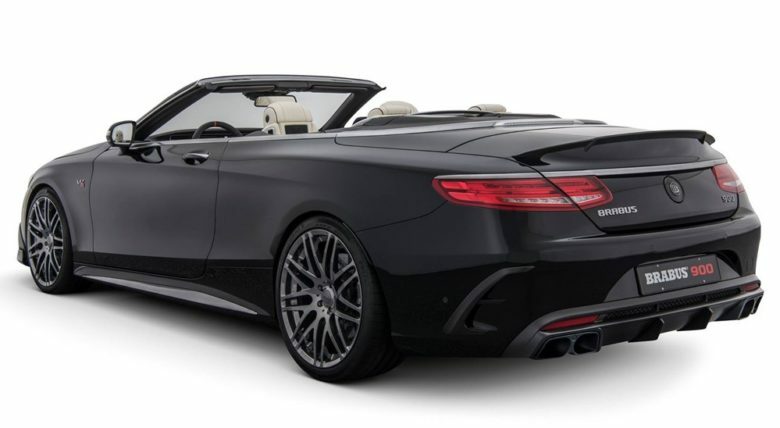 In case we made you curious enough, then just push the play button below and take a good look at what Brabus has done with this S65 Cabrio!